Everyone’s heard of a haunted house. Probably even a haunted theater. But a haunted play? Could it be haunted by the spirit of a man who recently died at the theatre? No... it’s not possible! At least, that’s what theater director Bonnie Bagwell tries to convince the other members of the troupe as writer Colin Chambers hints at the trail of horror that has cursed his script, Ax of Murder. Unfortunately, curiosity gets the best of the actors and, despite Colin’s adamant warnings, they open the script and start reading the play. It soon becomes apparent the play is mirroring their theater and even the specific actors. When a police sergeant shows up on cue stating he was called in on a murder, people begin to wonder. Wonder turns to fear when someone IS murdered onstage! And it seems as if no one could have done it. No body, that is, but perhaps a ghost. Join us for this “spirited” murder mystery. 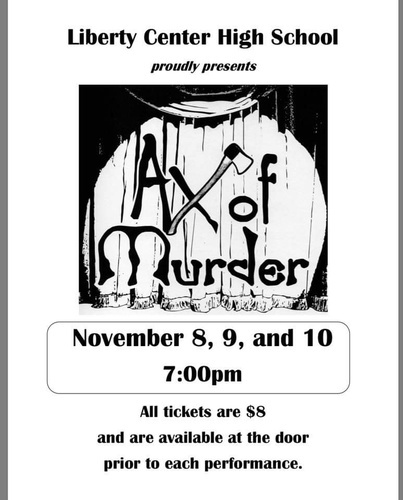 Shows are 7:00pm November 8, 9, and 10.